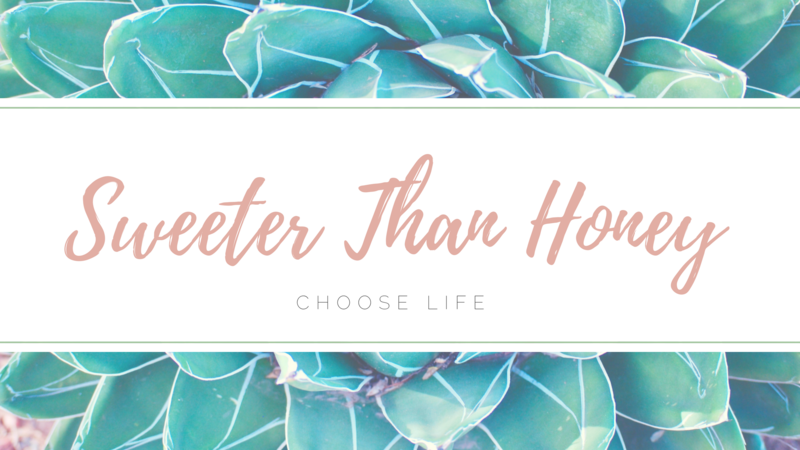 After many months of thinking on it and feeling called to do this, I finally made the decision to launch a faith vlog called Sweeter Than Honey. It has not been an easy dicision for me at all! First off, I think I sound like a chipmunk and twirl my hair way too much on camera (...ugh... self-conscious much?). I'm mostly an introvert and one of the things I hate most is public speaking. I also had zero clue about video editing or how to work youtube in general. But despite all of my excuses, it turns out my fears about the launch have all been taken care of and I hope to add many more videos! As Sweet Julian subscribers, you will not be automatically subscribed to my vlog. I just want to make that very clear. My faith vlog will be linked to from Sweet Julian, but because the content of my videos is not exclusive to baby loss, I am not subscribing anyone to it. If I ever post videos on the topic of baby loss, you will be the first to know and they will be on the blog. Otherwise you will not see my videos unless you head over to my youtube channel. I also want to note that these faith videos are deep word search and heart search kinda videos, so please only watch if you feel spiritually ready for that. Another note is that many of my videos will be directed at my own denomination which is something to keep in mind before watching. That doesnt mean you are not welcome to watch if you are not seventh-day adventist. I only speak from that perspective because I was raised as one and I have a heart for that group of people.